Sea Village#3-317 is an AMAZING Vacation Rental Property. Sitting DIRECTLY on top of the water. You can't get closer to the water than this. PHENOMENAL PRICE FOR THE VALUE! 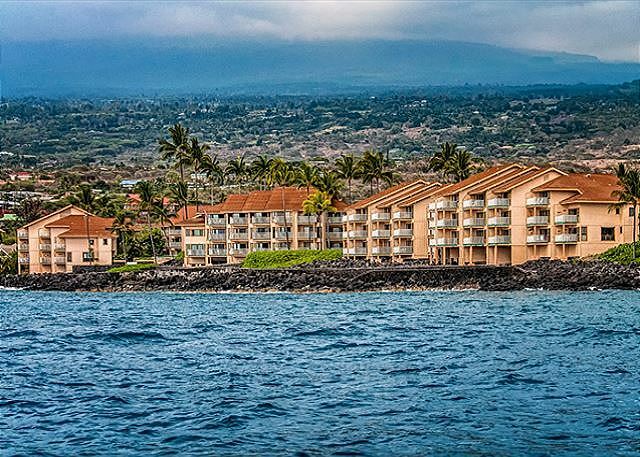 Sea Village Resort reflects the tranquil beauty of the Big Island. The resort is centrally located on the Kona coast close to the town of Kailua and the Kona resort areas. Lush tropical gardens extend to the oceanfront. 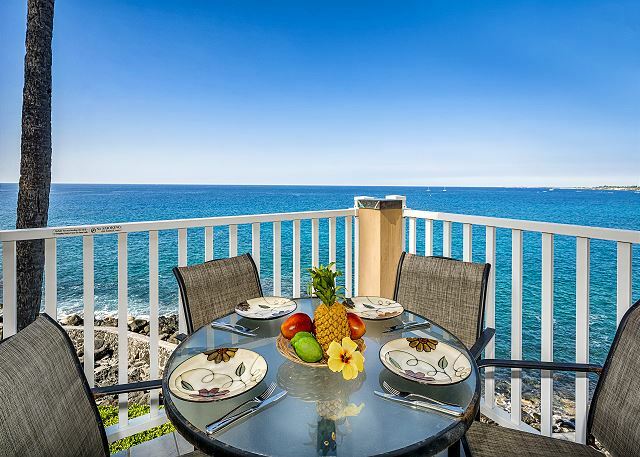 The condos at Sea Village Kona have expansive ocean views providing spectacular sunsets and views of luxurious tropical gardens. The pool area is located beside the sea wall, so guests can enjoy a peaceful swim just steps away from the crashing surf. Kona town is just a short drive from Sea Village Kona. Kona town offers a large choice of restaurants, stores and art galleries. Most of the Big Island activities depart from Kona town. it was as expected, wonderful. Sea Village was just amazing. We had such a great view. The condo was very clean up arrival. The view from the balcony of the ocean and the dolphins was incredible. The constant sound of the ocean was soothing and relaxing. Thank you for the experience. My son loved the pool and having a laundry room in the condo was extremely helpful. Thank you. Aloha! We're so happy your family was able to enjoy the location and amenities of Sea Village. Thank you for staying with us and we hope to see you again soon. Mahalo!! Everything was great, we really enjoyed our stay and would stay there again. Thank you. The Unit was exceptionally clean and neat, with cleaning products and items nicely queued on display for our use. Ocean View and sound was wonderful. The rental has excellent view of the ocean and can see dolphins from the balcony. Only complaint was condo below us was being remodeled so you didn’t want to be in the condo from 8-5 because it was like living in a construction area. Had the water turned off on us once. The condo is in a great location is clean and well set up. This is a direct oceanfront unit on the third floor with 180 degree views. We watched boats of all sizes, sunsets, and other activity from the lanai. Even saw some whales on two days. The unit was very clean and as pictured, except that there are new cabinets and granite countertops in the kitchen and bathroom. Management was very responsive and helpful. There is no elevator and no AC, but the cross breeze and cooler evenings made it very pleasant. We really enjoyed a tour of NELHA near the airport and the Body Glove Captain Cook dinner cruise. Also spent a night at Volcano House to see the volcano glowing and spitting lava at night, a truly awesome sight and sound, and took in the impressive 'Imiloa Astronomy Center in Hilo on the way back. The condo was a very good experience overall. I LOVED this condo! It is very nicely decorated and there is everything you need to cook & clean!! The washer/dryer was super great to have! There is a TV, DVD and games, if you wanted something to do. You are also close to the pool. It is only 1 mile from downtown, so you could walk, if you liked! Target, Walmart, drugs store, grocery stores - anything you are looking for is within a 10 minute drive - in other words the location rocked!!! BUT the best part is the view! It is SPECTACULAR to put it VERY mildly! I spent hours just looking and listening to the water. I saw humpback whales from the balcony. I left the door open at night to go to sleep to the waves. Perfectly place for a fantastic vacation! We stayed in Sea Village #3317 and everything was clean and had all of the appliances large and small that you could want. All amenities were anticipated and provided. The only reasons we did not give the unit 5 stars in every category is that it did not have a/c and was uncomfortable in the afternoons. Also the sofa in the living room was very uncomfortable. We would definitely recommend this unit to everyone with the above exceptions. We have stayed in 3317 several times. It fits us well. We are very satisfied with the unit and service. The keyless access upgrade and new electric outlets in the kitchen were nice changes. Generally good. Lanai furniture needs updating. Our stay was satisfactory overall. The view can't be beat and the unit has all the comforts of an apartment and plenty of parking, except for air conditioning! It was quite humid all week and almost unbearable. Property management should consider a swamp cooler or better fans! Coffee shop in the same complex makes it convenient. Main shops and restaurants on Ali'i Drive are about 2 miles away and the closest beach is about a mile away. There are days when tour boats would come out in front of the condos to swim with the dolphins. It's quite a sight. Wow. This was our first impression when we entered this condo. That view is outstanding but the condo facilities & cleanliness are just as impressive. This cond truely had everything you need - & reading the visitor book it was clear that others agree with most people retuning multiple times. We were lucky to be there when seas were calm & snorkelled from the rocks directly in front. Marine life in the bay is fantastic! This was my second visit to the Big Island and to Sea Village 3-317, Last year, I came here with my boyfriend, and left with my fiance'. It was a pretty easy decision to return for our honeymoon. Although the island offers hundreds of rental options, coming back to Sea Village was a no-brainer. The unit is spacious, impeccably clean, and the balcony offers unparalleled sunsets. 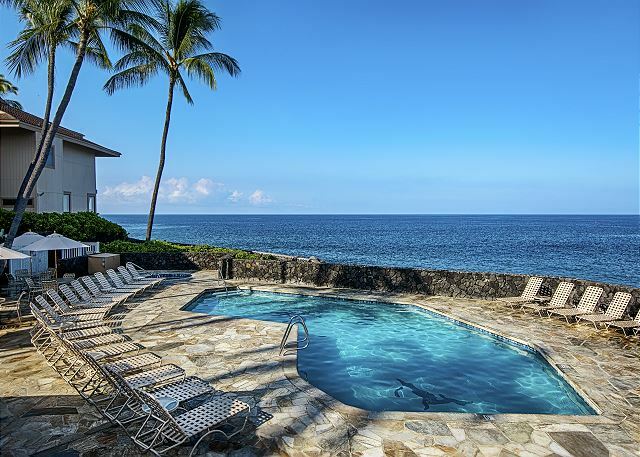 The location is in great proximity to world-class beaches, great bars, restaurants, and grocery stores, and conveniently located for trips to all points of the island (Hilo and Volcanoes national park both about 1.5 hours of beautiful driving). Finally, Knutson rental units are very fairly priced and the customer service is top-notch. I will likely return here with my husband next year. We couldn't have asked for more in any regard. We'll be back. We spent most of our time on the lanai enjoying everything the ocean had to offer, just beautiful! We love it here. We are actually VI owners and wanted to stay longer than we had points for, so decided to rent an extra eeek. This unit is in the same complex. It is right on the ocean with the waves crashing in front of unit, and even though there was really high surf we never had a problem with water. Love watching the waves. Unit needs some updating. Kitchen cabinets are in bad shape. Living room, however is lovely. Unit is very well stocked with pots and pans, dishes, towels etc. Actually they could clear out a shelf or two so there would be some storage space in bathroom. However, bottom line, bed was great, view outstanding, location, location, location. Oh, and you can walk to town. Everything was as agreed. Fine. Great location to walk to the village. Beautiful ocean view. Very clean and well maintained with great amenities. Everything we needed. Great to have a washer and dryer. Take note...not air conditioned so was a little warm but not unbearable. Some of the bathroom towels need to be retired. We enjoyed our say at Sea Village. The condo was dated but very clean. We loved the fact it was private and had an unobstructed view of the water. Also near enough to town to walk but far from the crowds. Only downside was no air conditioning. It was extremely hot even with several fans. 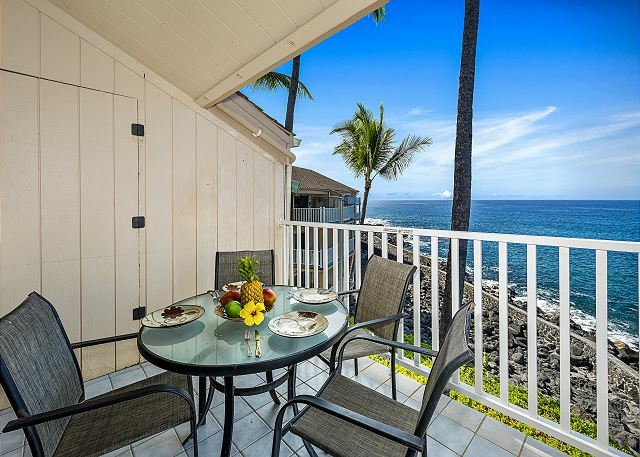 This apartment offers the best value for money, particularly compared with other resorts and hotels in Kailua-Kona. It is quiet (strict noise rules apply to the whole complex), well-appointed, spacious and clean. The uninterrupted ocean views provide endless enjoyment - spinner dolphins, snorkel tours, cruise ships, etc. all day. It's also close to shops and restaurants in town; but maybe too far to be considered walkable (especially in the hear) and public transport is pretty unreliable. The property manager contact (Blake) was superb. We called looking for a very last-minute booking when our original plans fell through. He organised our checkin seamlessly in less than 24 hours so we could get on with our holiday, and even honoured a heavily discounted rate for the low season. We stayed 4 nights in this condo. We were so happy to stay in this unit. Very nice ocean view, we had breakfast watching dolphine swimming and jumping. Very convinient location, clean, unit has ecerything you need. Fantastic unit. You couldn't be any closer to the waves crashing on the rocks below you. Views are beautiful. Issues: Bedroom windows open onto the outside stairwell. Some neighbors were very noisy at 6:00am. Several units had very rude college age kids, up late, loud and x rated conversations. Ice maker in-op (dumps out 1/2 ice, 1/2 water). Toilet flap needs replacing, toilet ran continually. Everything ran efficiently - key was in the lockbox - no need to contact Knudson agency at any time. Nice unit, fully equipped, great outlook - on the oceanfront. Fast and reliable wifi. Close to Kona downtown. Highly recommended. We had a great time on our trip was from 4-19 to 4-28 it's was a great condo no ac so it does get a little warm, the breeze it nice. Ice maker works awesome we drank a lot ;) ice melts fast. We bought some hydro flask and our ice lasted over night. Overall everything was great. My girlfriend and I flew into Kona from San Francisco on what she thought was a celebration for her 30th birthday. As if the beautiful scenes on the Big Island weren't enough, she was absolutely thrilled with our room at Sea Village. The ocean was so close you throw a stone into it from the balcony attached to the spacious living room. The rooms, bed, furniture, and appliances (of which we used the stove/oven, the refrigerator, the coffee maker, the washer/dryer, WiFi, and television) were all in excellent condition. Also, we met the friendly staff when they came to personally greet us and offer suggestions on dining/tourism/etc. I later proposed on this trip (she said yes) and our rental was a much better venue to celebrate than almost any hotel room could be. We already have plans to return to Sea Village next year! We stayed at the sea village for three weeks in Sept. of 2015. The condo was very nice----except they could use a new dishwasher. We washed dishes the whole time because the dishwasher was so rusted. But, the overall feel of the condo was really nice. The view is amazing from the lanai. We would stay at the Sea Village again. It was awesome. Loved the ocean right next to me!!! beautiful condo, especially love the lanai as it is a corner lanai offering excellent views of the ocean and especially sunset. The condo was spacious and had all the necessities needed such as kitchen utensils, washer & dryer, beach gear. The only thing I was unsatisfied with was the lack of AC, which was important as the weather was so hot and humid. Other than that, the location was close to everything.Had a great time here! 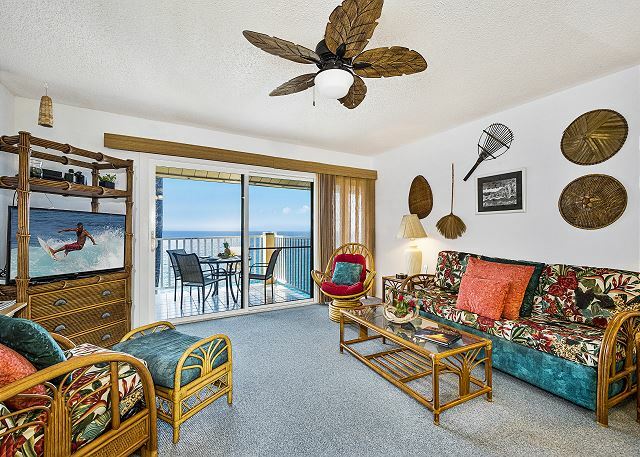 Prime location for sun and sunset lovers on the lanai! This unit has it all, nice furnishings and everything you need. 3rd floor view of the ocean is awesome! Loved staying here and walking to town took about 20 minutes so was perfect! This condo is fantastic. Right on the water, top floor, with 180 deg. views. 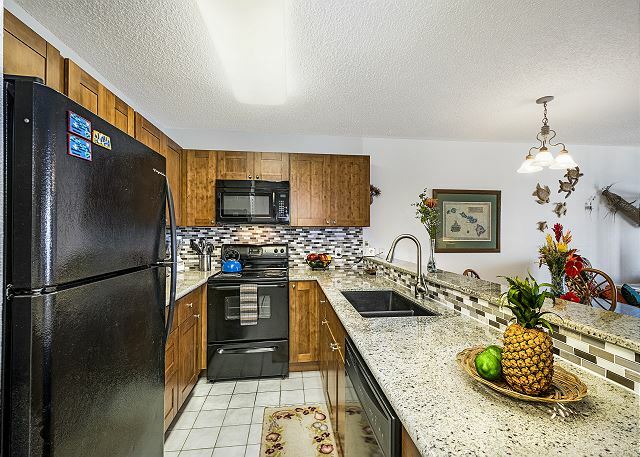 Fully equipped kitchen to make any meals. TV with great picture & heaps of channels. Good pool, but there's lots of beaches nearby for great swimming & snorkelling. 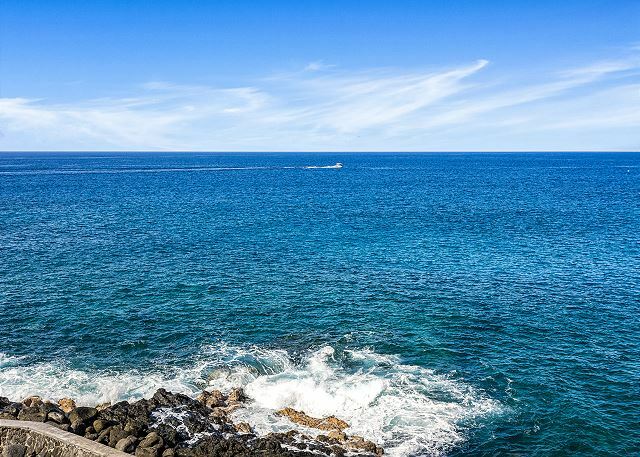 Kona town is 2 minutes drive away - shopping, restaurants & bars galore ! We spent our honeymoon here at seas village and we loved it. All the amenities were as advertised and the deck and view were just beautiful. We even saw dolphins swimming a couple hundred yards off our deck! The wifi and cable worked well not to mention the beautiful pool,spa, and BBQ areas which are private to guests. Sea village is also within walking distance to the main drag in kona. Highly reccomend! The property has a superb view of Kailua Bay. The view is spectacular. One morning there were so many dolphins swimming and playing off shore, you couldn't begin to count them. We also saw many whales during our stay. A great place for a restful vacation. This property is fantastic! It is right on the ocean with a beautiful, clean interior. It features a washer and dryer for the commonly wet bathing suits. There's a pool and hot tub right beside the ocean in the complex as well. The worse part of this condo was having to leave it. I highly recommend it to anyone! Very satisfied with 3-317, could have done with more than one tsp but ample crockery etc. enjoyed the extras - crib board & cards, binoculars, beach umbrella & chairs. Condo was in good condition, clean, although some of the bathroom linen looked like it might have been replaced in the cupboard by previous guests without washing, perhaps exit cleaners need to check the linen a little more thoroughly. Perhaps one load of washing powder could be provided. Très bien situé, intérieur un peu vieillot mais tout ce qu'il faut. La vue du balcon est vraiment superbe (vue sur la mer, coucher du soleil). Très calme le soir, un peu de bruit en journée car de nombreux condos en rénovation mais cela ne nous a pas dérangé car nous étions toute la journée à l'extérieur. Nous sommes trés content de notre séjour. Very well situated, inside a little bit old fashion but well equipped. The view from the lanai is fantastic (ocean, sunset). Very quiet in the evening and at night, but construction noise in the day, some condos being renovated, but since we were away during the day it didn't bother us. We were very happy staying there. We really enjoyed our stay. The condo was right over the waves and so we could hear them all night. It was in a good location, we had to drive to down, but the drive was only a few minutes. The grounds were beautiful...nice pool and numerous BBQs. This property made for a very easy, very relaxing vacation! Our favorite part was sitting on the lanai, enjoying the heat and sunshine almost everyday! There was always lots of interesting things to look at, dolphins, whales and saw a Manta Ray one night feeding where the light shines on the ocean. This is our second stay at this condo. Would return in the future. We enjoyed our stay at the SeaVillage 3317. Great location, very comfortable unit. Too many things to say about our vacation at Kona. We had a woderful time snorkelling at the nearby turtle beach and kayaking and snorkelling at Keakalua Bay at Captain Cook Monument. We spent a few evenings at Bongo Bens (good eating and entertainment) and many mornings and evenings watching dolphins ,parasailing,outrigger canoes and swimmers from the wonderful lanai at Sea Village. The condo was the past we have stayed in another condo. We were so happy with this condo that we booked for next year already to make sure we got the it. We had a wonderful vacation, enjoying the view and privacy on the lanae was a big part of it! We loved walking to town every evening to shop or enjoy the wide variety of restaurants, most with entertainment. Loved watching Bosco at the Kona Inn Shopping Mall, Wednesday through Friday on the Boardwalk, he is a very talented and fun entertainer. Barbacuing in the courtyard was great, is a beautiful area and always meet so many nice people. The best part of our vacation is being able to snorkel every day at many different beaches and always having great weather!!! This is our 10th year vacationing in Kailua Kona and staying in this unit and we highly recommend staying here. We have been to Maui 3 times and Kauai 6 and consider this island to be the best!!! We travel extensively and have used VRBO a lot in the past. This was the first time we have used a property management company and we will do this FIRST in the future!!!! The rate was below anything listed on VRBO. We also received an AMAZING deal on a car rental thru Knutson and Associates. We can't say enough about this particular unit: it was private, beautifully furnished, extremely well equipped, and updated. We can't wait to go back!!!! Knutson was extremely professional to work with and the booking process was very easy. We will Be back and want this Unit! We loved this location. We were happy to not be real close to the village. It was very quiet. Just had a wonderful time. Thank you Knudson and Associates for your professionalism. Look forward to our next stay. 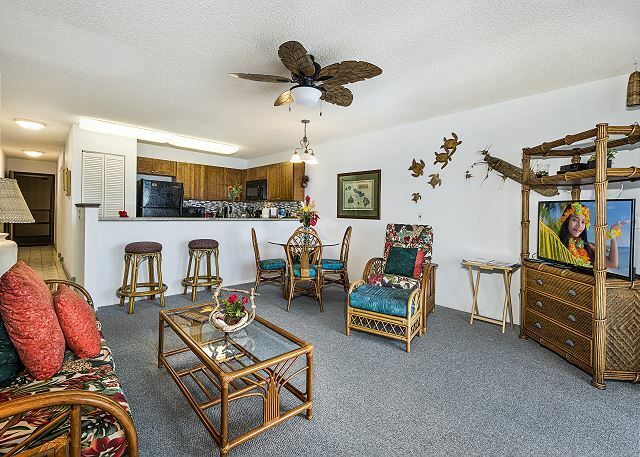 We love the location of the condo, it has a great lanai and this is where we spend all of our time. 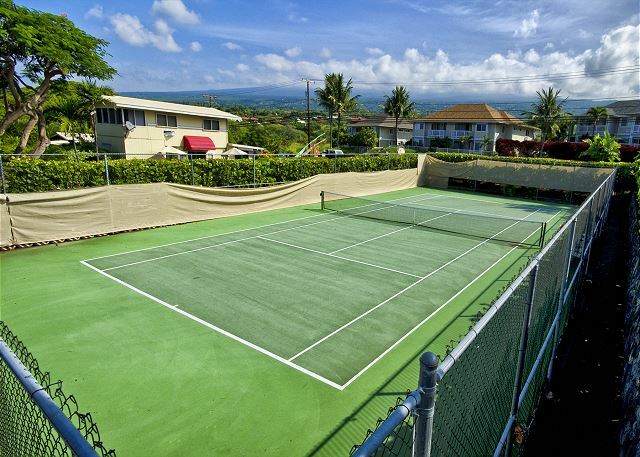 The complex is also in a great location, close enough to Kailua town that we walk there all the time. The complex has a nice ocean front pool and a great court yard where the barbacue's are located. The complex is very well maintained. Expect spotless for $104 fee- bathroom wasn't, and had had just a superficial wipeover. Also, dishwasher needs maintenance- drain leaks onto countertop. Aloha Steve, I am sorry for the inconvenience of the dishwasher. Once it was reported, it was repaired immediately. I am also sorry that you felt that the cleaning was not at standard. If that would have been reported to us, I would have immediately sent the cleaners back. I apologize, as in general, our cleaners are very good. Hope to see you again soon!